A man with a partial beard, mutton chops, and a very bushy mustache is captured by photographer George Frank E. Pearsall. The address of Pearsall’s studio was 298 Fulton Street in Brooklyn, New York. 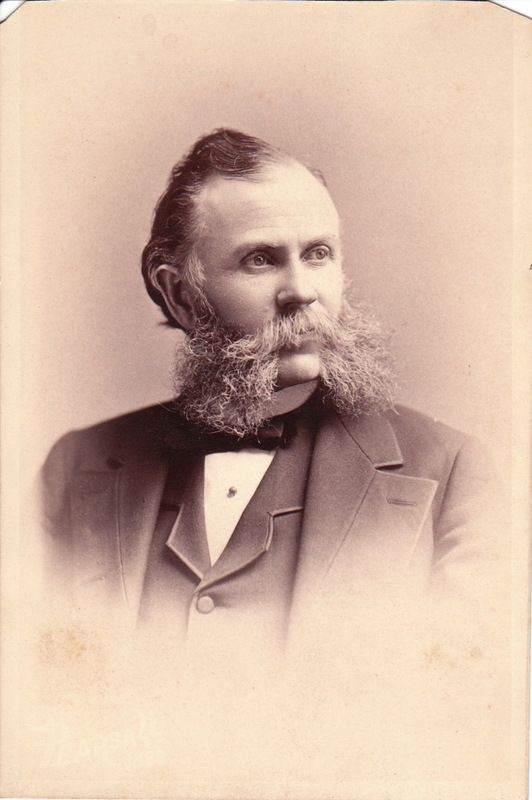 This portrait earns a spot in the cabinet card gallery’s category “Mustaches (Only the Best)”. Take a look at the category for some very interesting facial hair images. Frank Pearsall was born in New York City. His father was a life boat builder. Pearsall’s parents died when he was young and he and his two brothers were raised by an aunt in Saratoga, New York. In 1852 he began to learn about the photography business from his uncle who operated a gallery. After two years, his uncle left for Australia and the business failed despite Pearsall’s aunt’s efforts. Frank and his older brother left for an adventure and they spent eight years in such places as Cuba, West Indies, Venezuela, and elsewhere. In 1862 he returned to New York and worked as a positionist with celebrated New York City photographer Benjamin Gurney (see category “Photographer: Gurney”). He refined his skills working in the Gurney studio. In 1866 he married Long Islander Elizabeth Conrow. In 1870 he opened a photographic studio in Brooklyn which operated for two years at which point he moved his business to the 298 Fulton Street address. An 1880 advertisement asserted that Pearsall’s studio was the largest one in Brooklyn. Pearsall developed a historic camera in 1883. The camera was called the “Pearsall’s Compact Camera” and was unique in that it came in its own “carrying case” that also housed needed accessories. This design was imitated by all of the major camera manufacturers through the 1920’s. The British Journal of Photography (1876) published an article pertaining to a court case involving Pearsall. The case, Pearsall vs Schenck. was followed by photographers through out the United States because it involved a matter of universal importance to their business. The case concerned a couple that set for 17 poses at Pearsall’s studio. He sent them the proofs and they returned them. The couple contended that they did not like the pictures and would not pay for them. Pearsall demanded payment regardless of whether the couple liked the pictures. The journal took the side of Pearsall when they wrote that photography does not make “the human face divine”, it only reproduces it. The journal argued that the photographer does not have the responsibility of the painter to please the sitter for the portrait because the photographer can not control an image the way a painter can control a painting. Photographer can no change their subject’s “bad features”. The nose that is “snubby” will be “snubby” in photographs. “It is too bad to blame the poor photographer for the facial accidents of nature”. Tongue in cheek, the journal suggests the couple should have paid their bill or else the photographer might put their portraits in the gallery’s main display cases to be seen by all visitors. Pearsall won the legal case and the couple was ordered to pay for the photographs. The New York Times (1876) also reported this story but was less supportive of Pearsall. However, their article stated that the photographer should be paid for his time and supplies. The Times also made an analogy concerning the relationship of medical doctor and patient. The article asserted that patients had to pay their doctors even when they were not cured by the doctors efforts. Research revealed two interesting side notes. Pearsall was the President of the Brooklyn Archery club and in 1881 was the Secretary and Treasurer of the National Archery Association. A second bit of trivia is that Pearsall’s brother, Alva Pearsall, was a camera operator for Matthew Brady in 1871. 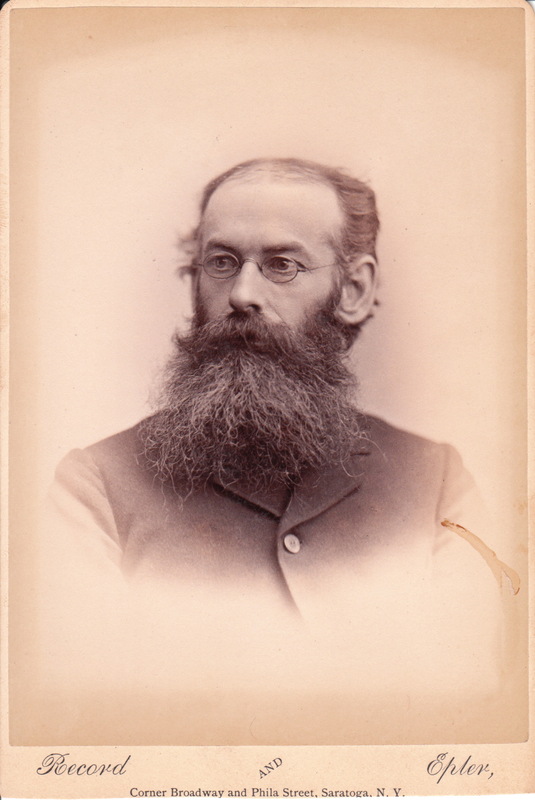 Mr E. H. Chapman posed for this cabinet card photograph at the studio of J. S. Wooley in Ballston, New York. He inscribed the back of this card indicating that he turned 67 years old on September 17th, 1895. He gave the card to an unidentified person, to mark the occassion. Mr Chapman’s eyes show a certain wisdom that only comes with age. 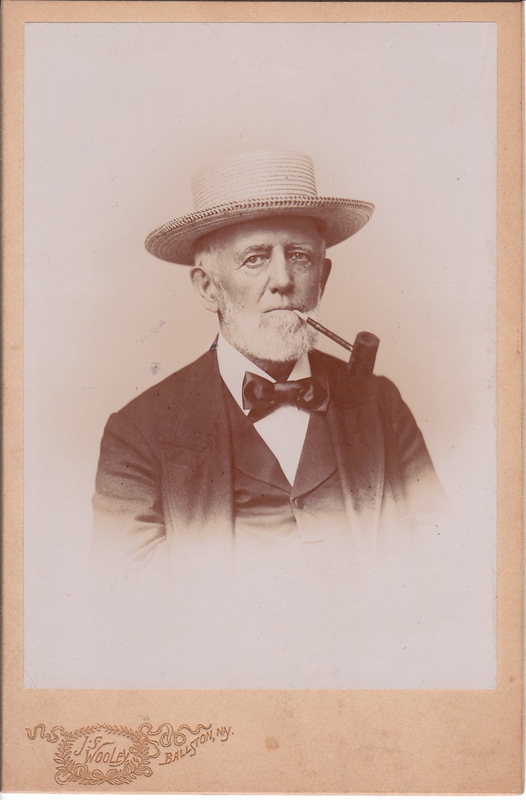 His pipe and straw hat add much character to the image of this older gentleman. Ballston, NY is in Saratoga County, and north of Schenectady. Research reveals that Edw H Chapman was President of the Ballston town board in 1856 and was involved in the manufacture of woolen goods and in 1867 had a business manufacturing bricks. 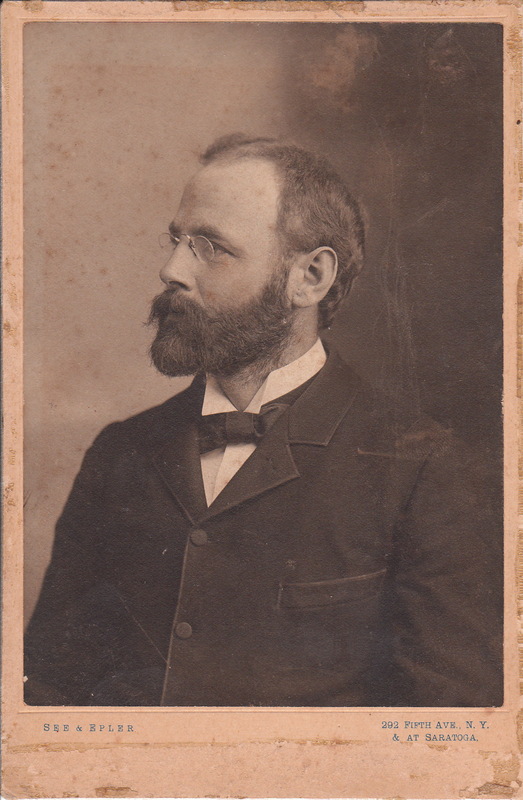 Research also reveals that the photographer of this cabinet card is Jesse Sumner Wooley (1867-1943). 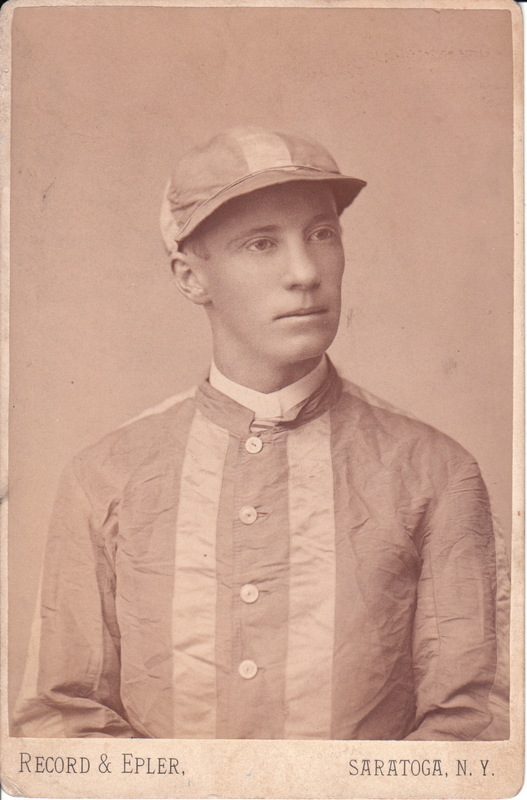 At age 13 he worked for a photographer in Saratoga and in 1887 he opened his own photographic studio in Ballston Spa. He became a noted photographer as a result of his taking expeditions and chronicling them in the form of lantern slide/stereoptic lectures. In 1893 he and noted landscape photographer Seneca Ray Stoddard took a photographic expedition exploring the Adirondacks and they prepared a photographic lecture about this trip. Wooley also took similar expeditions to Florida (preparing a photographic historical presentation), the Chicago Exposition (Worlds Fair), New York City (100th anniversary of George Washington’s inaugaration), and to California (Yellowstone National Park). The Florida stereoptic lecture is one of the few professional lantern slide/stereoptic lectures that survive today. This attractive young African American woman poses for her portrait at the studio of N. G. Brown in Saratoga Springs, New York. This is a terrific photograph of a young black woman taken by the studio of Record & Epler in Saratoga, New York. Quality Cabinet card photographs of blacks are not easily found because there were not many produced at that time in history. The Record & Epler studio is well known for their many stereographs and photographs of the grand hotels of Saratoga. It is also noted that the studio took a number of photographs of the Black employees of these hotels. To view other photographs from this studio, click on category “Photographer: Record & Epler”. This attractive woman is very nicely dressed and coiffed. Her face is very expressive. Judging by her facial expression, how do you think she is feeling as she sits for this wonderful photograph? Your comments are welcome.